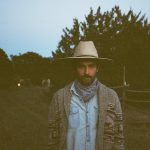 RF Shannon, or the project of Shane Renfro, has always been about expansive desert psych americana. Since the origin of the project back in 2013 with the recording of their first demo, Renfro and company have been doing this quite well. With two EPs under their belt, RF Shannon looks to try their hand here at a full length release. The result is, to put it mildly, epic.Jaguar Palace is a record to put on as a soundtrack for traversing a sun bleached desert. be that literal or figurative. 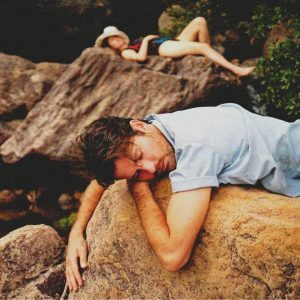 At six songs in length, you may take a look at the track listing and think that you’ve merely encountered an EP, but each song is meticulous and sprawling– a kite let out on its string to a great height, but still tethered to your hand at the ground. Our journey begins with title track, “Jaguar Palace,” which is a perfect introduction to the album. Delicate flute sounds and graceful piano fill your ears with wistful musings for almost two minutes before the guitar, percussion and vocals burst in. This well orchestrated build-up makes the full entrance of the sound huge when it comes along and lets you know you may want to take this album sitting down. Renfro’s vocals are layered and hazy, like a breeze that is gentle in one moment but almost knocks you down the next. Later on, he is accompanied by some female backing vocals that fully flesh out theforce and provide even more texture to the mix. Even one song in, you already know you’ve merely hit the tip of the iceberg in terms of whats in store. To pick one track out of this collection feels somewhat wrong, as it truly is an album you’re meant to listen to from start to finish, putting ‘single culture’ to shame. For the sake of the length of this review, I’m going to hone in on the heart of the album, “Tell My Horse” and “Had a Revelation.” These back to back numbers show the band hitting their stride with poise and finesse. “Tell My Horse” is a story of wandering alone, whispering tales of your wearisome travels to your animal companion. This is the sort of solitude that is welcomed on Jaguar Palace, embraced even, as the number picks up a nice bit of jam on its way out that carries into the next song. “Had a Revelation” is the shortest track on the record and it’s the song you should play your friends in order to hook them in. Renfro commands the song with his vocals, asking you probing questions: “Do you change with the seasons? Do you cling to the past?” Acoustic guitar carries the track, while slide guitar sneaks in and out, floating over the bouncy percussion. What’s superbly impressive about the tracks that RF Shannon have delivered here is that while they’re long and sprawling, you don’t notice. On the contrary, each number is careful and poised, akin to the chapters of an epic novel. They serve as gems of their own, but lace together with their counterparts.Jaguar Palacetakes a bit of time to really sink into, but after a few go-rounds of the steady waves of reverb drenched guitar washing over you, you’re fully immersed. If you let RF Shannon, they will hypnotize you into wading in deep and baptize you with their desert psych masterpiece. Get washed clean. Oh man, I am getting too excited for the upcoming full length album from Austin’s RF Shannon. They shared the title track from their upcoming release yesterday, and it beautiful, other-worldly trip into sun bleached psychedelia that the band does so well. It opens slowly with flute sounds and tinkering piano sounds, like a sleepy day begins, but then suddenly it picks up as the sun always seem to arrive and turn the sky rose before you realize it. Hazy vocals and steady percussion move the song along, accompanied by twangy guitars.Just when you think the song can’t get any more devastatingly beautiful, some female vocals join Shane Renfro, and you’re simply smitten in the psych-desert-blues glory of the song. Take a listen below. Have you preordered Jaguar Palace yet? It’s out March 31st. Get on it. Austin’s own RF Shannon have announced their debut full-length record at long last! The desert blues outfit have signed to Cosmic Dreamers and released a brand new single for your enjoyment. The single, which you should jam below, is called “Had a Revelation” and it’s every bit as mystical psych rock as you’d expect from the band. The whole thing sounds as though it’s coming to you through a layer of thick smoke; the guitars squall slowly and epically, while the vocals are drenched in reverb. It’s a solid track with a particularly gripping build that will pull you away from whatever other menial task you’re doing and make you focus on the song at hand. Jaguar Palace will be out March 31st via Cosmic Dreamer. Get stoked!